A Chinese customer stepped into a car dealership one day. The top salesperson of that dealership approached him and tried to sell him a car. But that customer only wanted to talk to Kit Wong. Finally this customer was turned away by the dealership, and Kit Wong could not sell him a car. It happened in 1971. Kit was furious of the discrimination. But he didn’t fight back at that time, because he knew that he was not in the position to get even. His angst instead motivated him to work even harder. He worked seven days a week, crawled through the phone books or went door knocking to find potential buyers. Soon, he became one of the top sales of the dealership. His boss would not turn away his customers any more. “”Don’t get mad, you get even”, this is a saying from one of my former colleagues. I always keep this saying in mind. My records put me in the right position and thus I get the respect that I deserve,” says Kit Wong from his Mercedes-Benz office in Markham. Kit has been working in the car retail industry since 1971. He is so familiar with the industry that he gets a nickname of “Dr. Auto”. Like many other entrepreneurs, he started his own business after certain years in the industry. With his experience and connections, his first auto sales and leasing business was a success. He then expanded his business to a car dealership in 1997. However, the car dealership story was a failure. Many reasons attributed to the unsuccessful venture, like the not-quite-popular brand name of the car, and the unexpected skyrocketing commercial property tax due to the amalgamation of the City of Toronto. He sold his shares after only two years in the business. From a dealership owner back to a frontline salesperson, Kit is happy with what he has achieved. 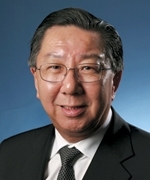 He was Past President of RHMCBA and 3-time President of Toronto Cathay Lions Club. He is always active in the community, emceeing for fundraising or community galas, golfing and dancing. Hindsight of his career and business? It’s still the same: Don’t get mad, you get even.